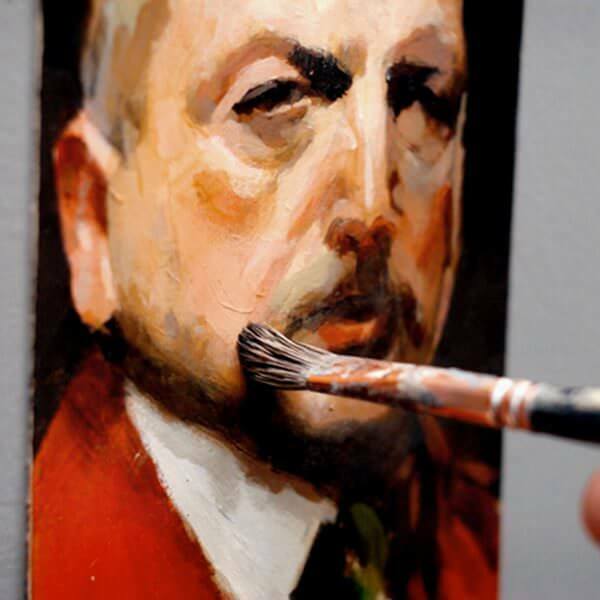 View cart “Oil Portrait Colour Glazing Course” has been added to your cart. After the pleasure of not getting headaches from oil paint and toxic turpentine, there seems to be double payback for daring to tackle a portrait with acrylics. Not only do the colours appear unsophisticated and garish but the paint dries too quickly to blend together successfully, especially when you’re trying to mix subtle skin tones. You can be left feeling disappointed with your results, admit defeat and crack out the thinners for another go with the oils. I want to introduce you to a new portrait course, that can help develop your portrait skills and dramatically shorten your learning curve to achieving classical looking portraits with acrylics. This portrait course will guide you through 3 different colour portraits tackling natural-looking subtle skin tones. Over 4 1/2 hours of tuition, you’ll focus on simple colour mixing with a limited palette so you can achieve repeatable results. 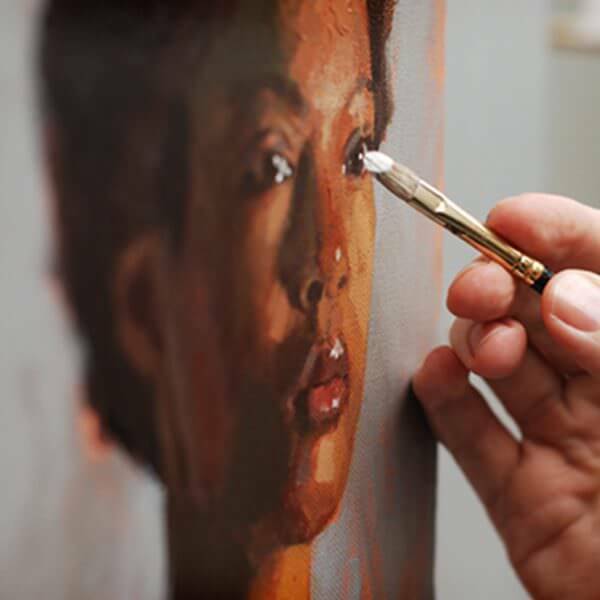 Each portrait tutorial looks at a different complexion and builds progressively, introducing mark-making and loose brushwork as your acrylic skills grow. Working through these simple step-by-step tutorials, you’ll learn how to approach a colour portrait from a photograph for maximum results, every time. However, when the relaxing days of college ended, I found myself painting in a small studio at the front of a teapot factory that was open to the public and mounting bills to pay…now the 6-month drying time of oils didn’t seem so attractive! Plan B – a crash course in acrylics. So I knew how to structure an oil painting but translating that knowledge to acrylics, to make them look like oils – wasn’t easy. The paint tube names were different to the historical colours I’d used with oils and they all seemed to be a lot brighter in saturation as well. The acrylics dried so quickly – I didn’t have time to alter the shapes on the canvas and the edges of my brushstrokes were just too severe. On top of that, there was a colour shift in the drying of the paints, that kept on putting my mixes out. So how did the paintings turn out? Pretty good, some award-winning. I exhibited at the Mall Galleries in London, became a finalist in the Artists & Illustrators Portrait Artist of the Year but the subtleties of tone and smokiness of the Old Masters still eluded me. I needed to change direction, think around the problem and come back with a new approach. Then I received the letter. You know the ones you don’t really think exist. It was a letter wax sealed with a Royal Crest. Had I been asked to paint the Queen? Not quite, but for me, the prize was even better. I’d been awarded a Queen Elizabeth Craft Scholarship to study classical portraiture in Florence, Italy. I could finally put all the pieces of historical information I’d put together myself, into an order that worked for me. It changed the way I painted and cemented my existing practice. I developed a method that enabled me to get consistently natural skin tones, keep the paint wet whilst using the minimum amount of colours and this is what I want to teach you in this course. The main problem with acrylics is they dry too quickly. You don’t have enough ‘blending time’ to create smooth subtle transitions. But what if you did 80% of your mixing before you even picked up your brush? If you just mix your portrait with the colours straight from the tube, you’re missing a trick. Subtle mixes, scumbling and glazing effects can all be easily achieved with acrylics if you have the right approach. We’re going to take techniques and colour palettes from the past Masters and combine them with the qualities and properties of acrylics, turning the ‘disadvantages’ to our advantage. This is a comprehensive, easy-to-follow 4 1/2 hour video course, where you will discover a fresh, quick approach to painting 3 different portrait styles. Coming from an art education background I’ve designed Art Curriculum for schools, developed interactive learning resources with the National Gallery, London and taught students from all different starting points the principles of how drawing and painting works. This course has been designed as a step-by-step rounded learning experience bringing together all my experience as a student, painter and teacher. 3 x portrait paintings, taking you step-by-step from drawing, right through to the finishing touches. Downloadable jpeg reference images, line drawings and a full materials list. Over 4 1/2 hours of detailed video instruction. A visual introduction to all the materials for the course from brushes to pigments. Introducing a 2-palette system that instantly increases the working time you’ll have at the easel. Understanding the importance of your studio lighting to create accurate colour mixes for your portraits. 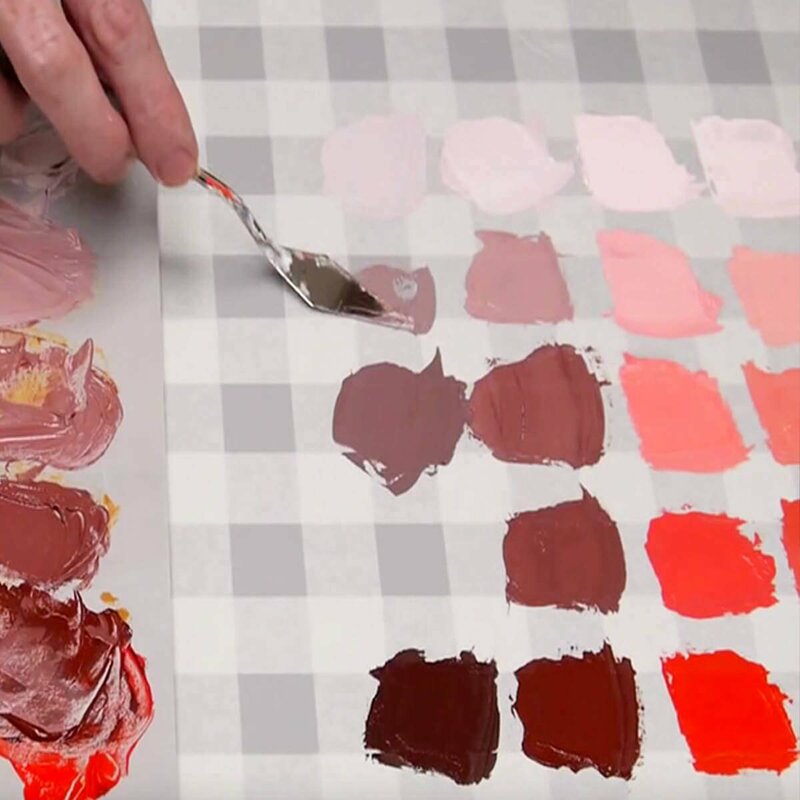 The amazing power of a limited palette to help you learn about your pigments. The first painting looks at cool, naturalistic colours working in an ‘in-direct’ style. This is a method of building up many layers working with glazing and scumbling. The second study is a warmer palette working with colour strings and base colours so your painting practice becomes more effective and efficient. We use a more direct, Alla Prima style for this poster study. Extending our palette, and introducing a wider range of pigments for more advanced skin tone mixes. The final piece challenges your skills and combines thick impasto work with the palette knife and subtle delicate glazes for a darker skin tone. Glazing scumbling & blending, allowing you to create atmosphere, mood and sophisticated tonal shifts for this final piece. I’ve taken care to film everything from my perspective so you can see exactly what I’m doing as we go through the entire painting process in real-time. With over 4 1/2 hours of video instruction, full-color photographs and drawing guides. 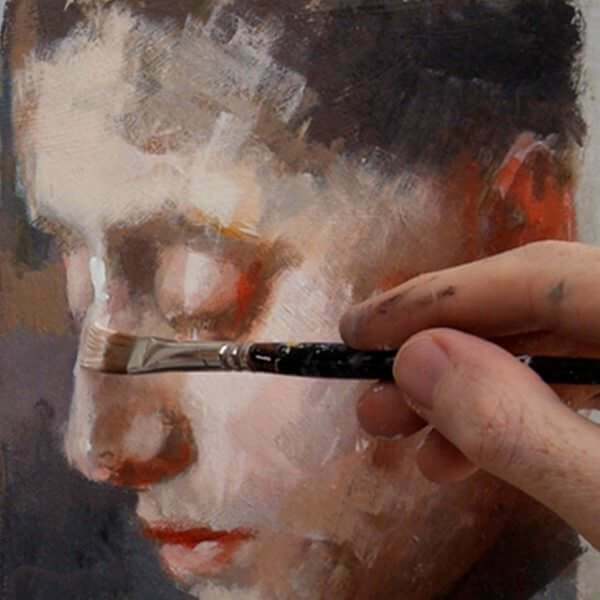 A Your Paintings Downloads PDF guide – which includes all the reference images used throughout the course, alongside stages of my more detailed paintings. The video files are large (2.8GB in total) so you need a broadband internet connection and enough space on your computer hard drive. A broadband internet connection – the files sizes for the video lessons are quite large (2.8 GB in total) so can take a while to initially download (depending on your internet speed.) Once downloaded, they are yours to keep forever, watch without buffering or take to the garden and watch away from an internet connection! Enough free space on your Computer or iPad – You can download the files to a separate USB stick if you need more storage. My art teachers were all magnificent human beings and often gifted practitioners, but not one of them ever sat me down and showed me the mechanics of sketching, or painting, beyond advice to the effect of “Don’t make such faint marks,” “Stop drawing outlines,” or “What do you mean you’re too young to drink cider?” Or maybe they did, and I just forgot. Serves them right for giving me cider. As a result, I learned my drawing from comics and galleries and my painting from Tony Hart (little reference there for the kids, yeah). This can only carry you so far. So after several false starts and two quick decades, in 2017 I decided to do something about it. After a trawl of the web and a realisation that I didn’t have the funds to afford a regular real world art class, I stumbled upon this excellent chap, and I can’t praise him highly enough. Will Kemp is the art teacher I wish I’d had all those years ago. After a very intensive month following his Acrylic Portrait online course, I had all the tools I needed to mix my colours confidently, lay a decent ground colour for my canvas, apply glazes, and generally achieve something approaching the results I’d had in my head all those years. I tell you, what Will Kemp doesn’t know about the Zorn Palette isn’t worth knowing. Before my last coursework study was dry, I’d begun to subject my immediate family, my bedraggled self, several passing strangers, and my ailing cat to the rigours of my newly refined brushwork. There’s no stopping me now. Anyway, I couldn’t in all conscience go posting my paintings up here without tipping my hat to him. I’m not one to gush, but I just want to thank you for your tutorials. I’ve always loved to draw but was afraid of painting b/c I didn’t feel I had enough control, like when I grip a pencil. I took a local class a couple of years ago ( pretty much worthless) which led me to search Youtube. After watching many videos, I found yours, and have virtually watched everything you have for free. Then I bought 3 of your courses – I’m in the middle of your acrylic portraiture. I have learned so much from you that I feel I’ve actually finished my college art degree. Your classes are so informative, easy to follow, profound in what they impart, that I’m thinking why have I not pursued this all before. But, then, you weren’t around when I was flailing. I’ve completed 25 paintings in the last 2 months…and they aren’t half bad. At least, I’m happy with them and having SO MUCH fun. Thank you. I have taken two of your tutorials and I cannot tell you how much they have helped me – in both technique and confidence. My husband has wanted me to draw, sculpt, paint, etc. for most of our married life. For the first time last year, I did 6 10×10 acrylic portraits of each of my grandchildren (all outlined silhouettes – pretty my like a sketch) type pictures. They turned out pretty well and I fell in love with painting. I had not done anything else since, so I decided to experiment with some portraits for my husband for this Christmas. After attempting 3 times do a single portrait and washing over the same canvas for the third and final time – I throw my hands up and decided painting was not for me. But, my husband kept the pressure on and seemed to believe in me more than I did myself. I did some research on YouTube and online and found your courses (acrylics for beginners and portraits). I loved them both, they were so helpful to me. I have had no other training/education in art, but after I completed your courses in October, I set up my small studio and began to go to work again with “my painting”. I painted the first picture and thought it turned out pretty well, then another and finally just a couple of weeks ago the final of three all 10×20 on canvas. I am still having issues with my blending techniques, shading and color corrections, but figure that will come in time. Well, to say the lease my husband love them! I just wanted to take this opportunity to thank you, thank you, thank you for helping me give my Husband the priceless gift of a lifetime. Does it cover working from a live model? No, this course works from downloadable photographs, so you can follow along with the demonstration that I’m working on. I find this approach gives confidence with glazing and brush techniques. If you’re new to acrylic painting or have been painting for years but still have trouble mixing tonally accurate skin tones and find creating subtle blends difficult, then you would see instant improvements on this course. If you’re looking for ‘cheat sheets of skin tone recipes’ this isn’t the course for you – there’s nothing wrong with specific recipes for skin tones but because of the huge variety in sitters complexions, lighting conditions and style of painting there isn’t a one size fits all. Having the knowledge to create your own recipes is much more powerful as an artist. Does it cover portrait drawing?